Where can I stream the Dell Technologies Championship? Sky Sports subscribers can stream the tournament online via Sky Go. What type of player is suited to contend around TPC Boston? Some of golf's biggest names have won around TPC Boston. It is a course suited to the very best ball strikers who have the skills to overpower the somewhat shorter course with long, accurate hitting and laser-like approach play. What is the format of the Dell Technologies Championship? 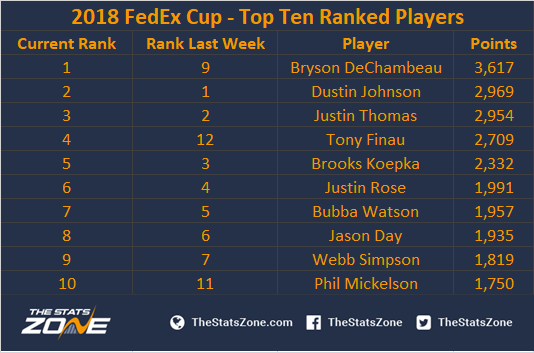 The top-100 ranked players in the FedEx Cup standings are competing this week with just the top 70 progressing to next week’s BMW Championship. What is the predicted weather for the Dell Technologies Championship? Chance of thunderstorms Thursday and Sunday which could cause delays. Overcast Friday and Saturday with slightly cooler temperatures. Ryan Palmer entered last week ranked 100th but moved up 50 spots after a final-round 65 and T5 finish. Cameron Smith put himself in the mix, moving up 37 places to 16th after four rounds in the 60s and a T3 finish. Jhonattan Vegas climbed 46 places to 87th after a T15 placing when he needed it the most. Nick Watney climbed 35 places from 102nd to 67th after a T11 finish, recording four solid rounds in the 60s when needed to stay in the race. Adam Scott continues his impressive form, moving up 33 spots to 40th after a T5 finish including a second round 64. Charley Hoffman jumps 23 spots from 98th to 75th after four consistent rounds and is in good form as he heads to a course he has previously won at. Tyrell Hatton climbed 21 places to 71st and kept himself in the playoffs after a low score of the day 64 on Sunday, finishing in a tie for 20th. 2014 FedEx Cup winner Billy Horschel moved up 41 places to 14th after a T3 finish which included a Saturday 65 and further proving his love for the playoffs. J.B. Holmes fell 11 spots to 80th after missing the cut and will need a good week to climb back into the top 70. Jason Dufner’s season was nearly over by dropping 10 places to 100th after missing the cut. Russell Henley, Ollie Schniederjar, Russell Knox, Branden Grace and Abraham Ancer all fell dangerously close to missing this week after not making the cut, shooting two rounds over par and are all ranked between 91st and 96th place. Tommy Fleetwood ranks 23rd after a T20 finish where he was in contention until a third round 73. Ranked 9th in strokes-gained tee-to-green, expect the Englishman to cement his place at Eastlake early. Phil Mickelson sits 24th in the FedEx Cup race after a poor second half of the season. However, a solid four rounds resulting in T15 suggests he’ll be moving up the rankings this week to finalise his place on the Ryder Cup team. 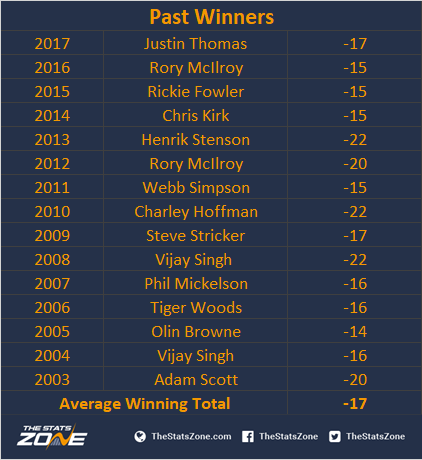 After a T40 finish last week, Tiger Woods will be looking to make a move from 25th spot in the FedEx Cup this week around a course he has had success on and it should suite his approach-the-green game where he ranks T4 in strokes-gained. Adam Scott moved up to 40th in the ranks after back-to-back top-five finishes which suggest he’s finally returning to form. Expect his game to continue trending in the right direction and he is a firm favourite for victory this week. Ranked seventh in SG: approach-the-green, he could well move into the top ten here.